This book presents cutting-edge multidisciplinary work on the characterization of ancient materials; the technologies of selection, production and usage by which materials are transformed into objects and artifacts; the science underlying their deterioration, preservation and conservation; and sociocultural interpretation derived from an empirical methodology of observation, measurement and experimentation. 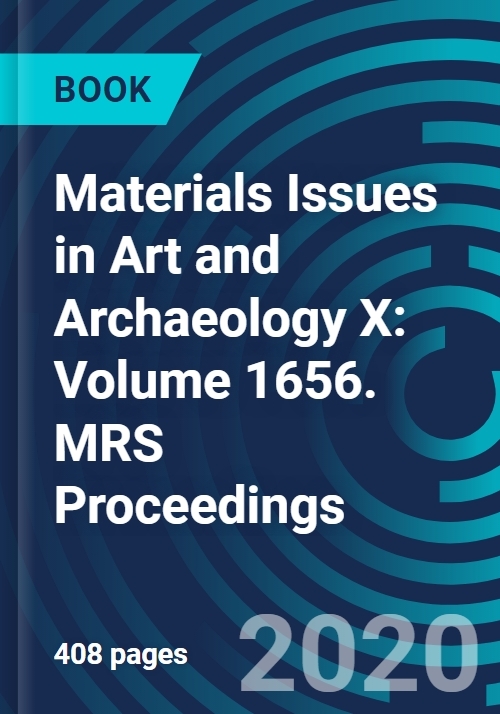 Of particular interest are contributions which explore the interface and overlap among traditional materials science, the history of technology and the archaeological and conservation sciences, or that investigate new methods and applications of materials science in art and archaeology. Topics include: analytical chemistry and spectroscopy; ancient and historical metallurgy; natural and artificial glass; characterization, sources and production of ceramics; organic materials technologies; architectural conservation and materials characterization; conservation of archaeological and historical materials; and other studies of ceramics and metals. 28. The potential of low frequency EPR spectroscopy in studying pottery artifacts and pigments. Pamela B. Vandiver University of Arizona. Philippe Sciau Université de Toulouse. Christopher Maines National Gallery of Art, Washington DC.